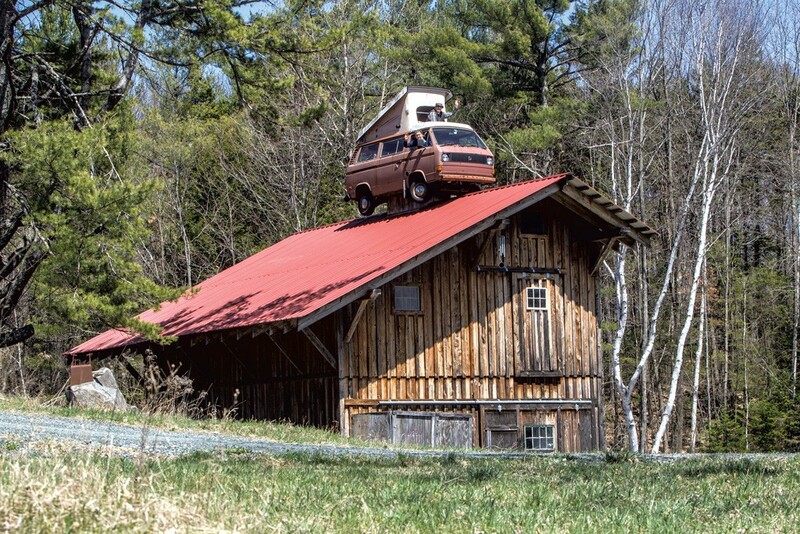 Forget the Treehouse — Put This VW Bus Cupola on Your Barn | Habitat | Kids VT - small people, big ideas! Say you're building a barn. From the roof, there's a great view. Then say you know someone selling a busted 1980 Volkswagen Vanagon. And a guy with a crane. These things may seem disparate, but not if you're Dave Shinnlinger. He'd owned several Vanagons in high school and dreamed of integrating one into a building. So when his barn needed a cupola, hoisting one of the boxy buses up there was "an obvious conclusion." The idea took shape in 2005, when the veteran high school woodshop teacher was building a barn for machines and tinkering projects next to his Canaan, N.H. home. At the end of a hard day's work, Shinnlinger and a friend were on the roof, admiring the fields and nearby towns of Grafton and Enfield, when his friend suggested a cupola, reminding Shinnlinger of his old idea. Then his friend mentioned that someone he knew was selling a Vanagon — and Shinnlinger thought of the guy with the crane. After shelling out $100 for the van, Shinnlinger started what he calls "backyard engineering" to construct a rooftop support for it. He built a cradle-like wooden framework into a hole in the roof's frame. And with metal seismic straps, typically used to secure houses to foundations in areas prone to earthquakes, he attached the van to the cradle and secured its doors. Before hoisting the VW onto the roof, he removed its engine, transaxle and gas tank to lighten the load. It took just 15 minutes to lift it into place — with Dave, his family and a few friends looking on. Inside, the bus feels like it could be on solid ground. All of its classic VW camping components are intact including a table for coffee cups or card games, and a foldout bed, on which many people have spent the night. It's when you look out the windshield and see a roof, and the expansive view beyond, that you fully realize Shinnlinger's lofty goal. 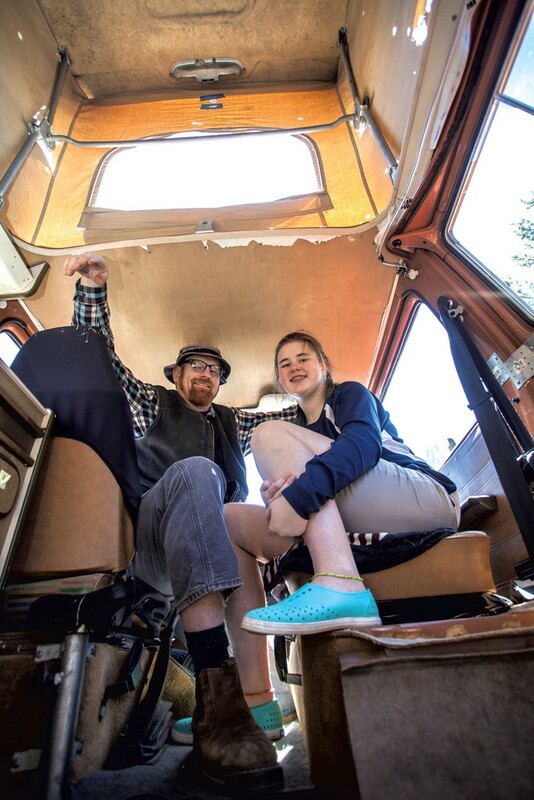 "It's pretty awesome," says 13-year-old Ella, who occasionally uses the van as a hangout spot. "I get asked the question ,'Why did you build it?' a lot," Shinnlinger says. "But for me, it's more a question of, 'Why not?'" For Halloween, the Shinnlingers decorate the van with twinkling lights and turn on its headlights. To access the cupola, visitors climb a sturdy ladder that runs from the second floor of the barn to a hole that Dave cut in the bottom of the vehicle. Between the two front seats, the couch/foldout bed and the bicycle seat screwed into the floor behind the driver's seat, the van can accomodate four or five people. 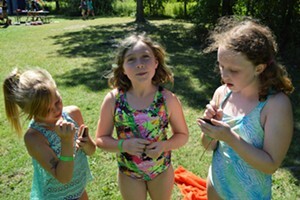 Several family friends have enjoyed camping out in the cupola while visiting the Shinnlingers, and the girls like to hang out there with their friends. The van's pop-top still works, as do many of the vehicle's manual buttons and levers. The steering column is connected, so turning the steering wheel moves the wheels. If you are considering a similar project, Shinnlinger suggests checking with your insurance company. The family was dropped from their homeowner's insurance because of the perceived safety risk, but they were able to find a better deal.